Here is an app that could help streamline your dietary ambitions. intelli-Diet app for iPhone aids you lose weight by giving you realistic goals such as what to eat and at what times. And the best part is that the app gives you a diet plan from the food items that you yourself have chosen, rather than forcing you to follow an arbitrary diet plan made out of nowhere. intelli-Diet iPhone app comes at a price tag of $3.99. intelli-Diet app for iPhone creates a well balanced diet plan based on user preferences; it tells you exactly what food and what quantities to eat and when. But prior to doing that, the app might require some set up to start with. That is, you’ve got to enter basic info such as weight, height, date of birth, and gender, and based on that, the app will calculate your Body Mass Index (BMI) and lets you know which category you belong to (whether you are underweight, normal weight, overweight, or obese). You can also set your target weight, and the app will calculate the target BMI. The app also tells you the approximate date when you’ll reach the target weight, depending upon the level of exercise you select. Exercising is your own prerogative, and the app can’t help you in that regard. You will also make a wide range of diet preferences wherein the choices are made from across five categories: protein, carbs, fat, fruit, and veggies. The choices made can be changed anytime from the settings tab. 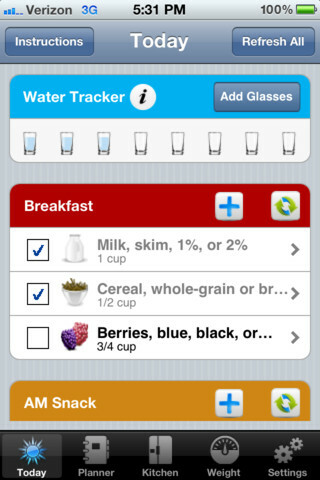 Based on the entered/selected information, intelli-Diet iPhone application makes a daily and weekly food plan for you. This includes five meals: breakfast, morning snack, lunch, afternoon snack, and dinner, and you can enter the preferred times for each meal so that the app will remind you to eat at the set time frame. The meal plans are customizable; individual items can be changed by tapping on a food item and selecting an alternate one. It is also possible to refresh each meal/whole day to view different food options. The quantity of food one is supposed to eat is also shown along with each item. Once the meal is over, check off the item from the daily meal plan. You can even email a diet plan from iPhone intelli-Diet app. From the Kitchen tab, you can modify meal plans depending on what food items you got at home. Unavailable foods are displayed in the shopping list, which can be emailed. Further, there is a Weight tab that acts as your weight tracker. Add your diet/weight, and follow one’s progress in a chart/table. 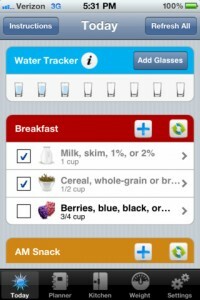 intelli-Diet app for iPhone is a very convenient all-in-one diet app for iPhone. It builds a diet plan for you based on what food items you have in your kitchen cupboard. A must have if you are determined about losing weight this year at least.